This game was on the backburner for many years, but I finally got around to completing it. The story takes a while to get good and honestly it is probably the weakest game in the series, but it was still pretty good overall. I just think that the game should have been a little less formulaic and should have gone for a more connected and changing story. It would have made the whole thing a lot more interesting and Ratchet and Clank is always adapting like this. It would have been simple enough for Sly to have copied that approach. Well, it is what it is. Sly had finally gotten his happy ending after the third game. He pretended to lose his memories so he could live a peaceful life without having to force Carmelita to choose a side. Unfortunately, someone is messing with the timestream and Sly can’t just let this go unpunished. He must bring his thieving skills back to work with his old gang as they time hop to find the source of the problems. The trust that has been lost between him and Carmelita may be hard to repair so this case is going to be a very personal one. Is Sly up for the job? As always, this Sly game is a 3D platformer. You use stealth for most of the game as you get from point A to point while getting past obstacles. You can also fight enemies and take them out easily enough, but it’s usually faster to slip past them or use the one hit KO stealth attack. Each area is very large so you have a lot of room to maneuver and you can also use that time to grab some extra collectibles. They’ll all come in handy by the end if you want to earn the shiny Platinum to add to your collection. You can never have too many trophies right? This is the only Sly game that I have not Platinum’d yet so I aim to fix that at some point in the future. Aside from playing as Sly, you get to play as a lot of other characters this time around. That’s because one of the gimmicks in this game is that you finally get to meet Sly’s ancestors. Each era in time has a Cooper and they all have their own special abilities. One can climb walls and another has a gun. This results in some new twists that are added to the usual gameplay and that’s a good way to make the gameplay more diverse which was good. Bentley also gets his own minigames as one is like an overhead version of Tron and another is a 2D shooter. His minigames were always fun so I was glad to have them around. Murray’s is probably the least exciting as you just go around punching people. Finally, we can’t forget the short driving levels as you play in the mini car. Those were a nice change of pace as well, but in the end, the classic Sly gameplay is still the best. As always, the gameplay is handled really well and the controls are very smooth. It makes the cases fun and going around the city is so streamlines that it makes the grind for all of the collectibles very manageable. The quick time event bosses were always handled well and they always feel great no matter how many games use them. Final Fantasy XIII-2 still did the best job out of all the games, but it’s a little hard to match the level of epicness that title was able to attain. Graphically, Sly looks good. It may not stand out the same way that something like Super Smash does, but it holds up well on the good ole PS3. When it comes to the soundtrack, that part is a little more bland. You aren’t likely going to remember a lot of the tunes once you’re done. They’re passable, but just aren’t anything all that grand when you really get down to it. There is a good amount of replay value here as you can go back to all of the chapters to grab treasure, collectibles, and open the safes. Buying everything from the shop will take some time as well and each story level is roughly an hour or longer. It’s certainly a game that gives you a lot of content for the money that you paid, which sounds good to me. It’s not artificial length like some other games either as you’ll feel a sense of accomplishment as you go through. I do want to take a second to say that all of the past Coopers were annoying. I felt like the game wasn’t even trying with them as they were all super gimmicky. The cave man Cooper was the most annoying as you couldn’t understand what he was saying and he just wasn’t that smart. All of the Coopers had a lot of attitude, but it wasn’t deserved as we had to save them all from the villains. None of the Coopers were able to do anything on their own so you have to question how they got such a famous legacy. Evidently, Sly is the only cooper who can hold his own. It just makes you wonder. Sadly, the classic banter that we had in the previous games is gone in this one between Sly and Carmelita. It’s an unfortunate side effect of their dynamic completely changing thanks to the third game. I’ll definitely miss it since the Sly games had the strongest dialogue from the three main Naughty Dog series for a while. The writing’s still good, but it’s just not as clever. Sly’s still a good main character even if he made a lot of the wrong decisions. Carmelita’s also good as the tough rival who is always making threats although this is not her best portrayal. Murray and Bentley are around as usual. I can’t say that they’re my favorite characters though. The villains are all right I suppose, but while they all technically have personality and character thanks to their origin stories, I never got too attached to any of them. The main villain is also a Skunk who is comic relief so he isn’t meant to be taken seriously either. 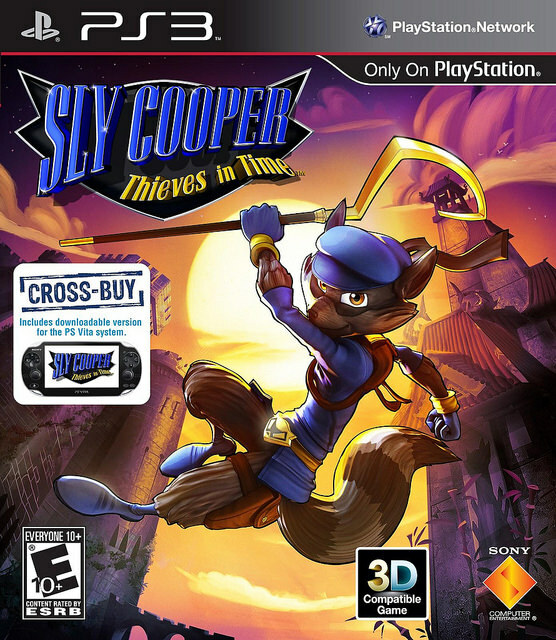 Overall, Sly Thieves in Time is a good installment to the series, but it’s not the game that I want to be known as the final in the series. It’s certainly a step down from the other games and that’s partially why it took me so long to complete it. I was never able to play the game with the same gusto that I tackled other titles with. It was a good throwback since a game hadn’t come out in a very long time for this series, but the plot did hold it back quite a bit. The supporting cast just weren’t all that good and this game lacked the impact that the first three did. It really survives on the gameplay alone because every other part of the game was either not that great or simply could have been better. To be fair, gameplay still is the most important quality in a game so that is enough to justify a good score. The cliffhanger for the game is pretty intense although to fully see it you better get that Platinum Trophy ready. It does make you wonder about some things though. All those months…what was Sly doing? It depends on how you interpret the ending I suppose, but another game would clear that up. This is certainly a must buy for Sly fans and generally, I think any platformer fan will be able to appreciate this title. This entry was posted in 7 Star Games, Game Reviews, Games, Reviews and tagged Game Review, Naughty Dog, Platformer, Playstation, PS3, Review, Sly Cooper, Sony, Thieves in Time, Time Travel, Video Game Review by dreager1. Bookmark the permalink.